Dr. Sunbulli is the founder of GI Associates and has been in practice for over 34 years. Throughout his medical career, the driving force of his passion for medicine has been caring for his patients. 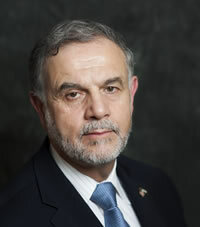 Dr. Sunbulli received his medical degree from Damascus University in Syria, and then completed formal training in Internal Medicine and Gastroenterology at Cook County Hospital. But Dr. Sunbulli’s caring extends far beyond his daily patients. An active physician in charity work, he has provided medical services to the poor in the Chicago area through Interfaith House and other organizations. He’s also travelled to Turkey and Syria to provide medical care for the refugees there. Fluent in Arabic, Dr. Sunbulli plays a key role in communicating with the refugees, determining their needs and providing the necessary care. In his daily practice of medicine, Dr. Sunbulli specializes in biliary disorders, gastrointestinal stenting for malignancies as well as general gastroenterology. He was also instrumental in building the new gastroenterology lab for Little Company of Mary Hospital. Affiliated with Little Company of Mary Hospital, Advocate Christ Medical Center and Palos Community Hospital, Dr. Sunbulli is considered the top expert for gastrointestinal cases in the Chicago South suburbs. Outside of the office, Dr. Sunbulli is very active as a board member for several organizations. He is a current member of the American College of Gastroenterology, American Society of Gastrointestinal Endoscopy and the American Gastroenterology Association. Dr. Sunbulli is also a dedicated father and grandfather.